Distribution transformers are normally located at a service drop, wires run from a utility pole or underground power lines to a customer's premises. They are often used for the power supply of facilities outside settlements, such as isolated houses, farmyards or pumping stations at voltages below 30kV. 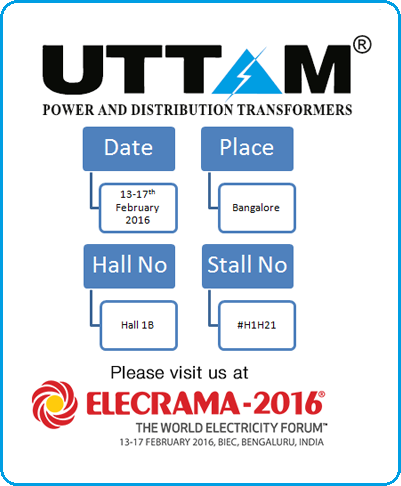 UTTAM make three phase distribution transformers are available in stack core / wound core upto 160kVA and stack core upto 3000kVA. They are made available in aluminium / copper as per requirement. On demand higher rating can also be offered. Applicable Standards	 IS, REC, CBIP, IEC, ANSI, JIS, BS etc. 1. The above quoted electrical performance data are subject to standard tolerances, including losses. 2. Weight, Quantity & Dimension figures are approximate & subject to ±10% tolerance. 1. The above quoted electrical performance data are subject to standard tolerance, except losses, which are maximum guaranteed without any positive tolerance.